Zap Cap Crown Cap Bottle Opener. OK, stunning stroke of genius, remake the Zap Cap in the shape of a crown cap. Then make it in elegant black. 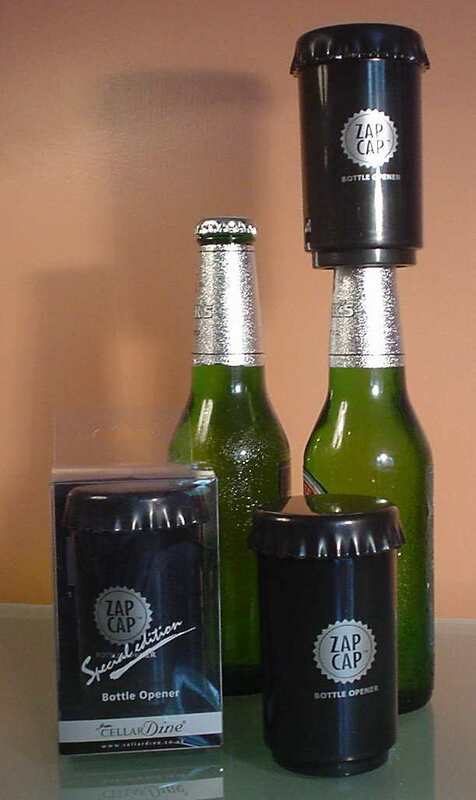 Working just like a regular Zap cap, you flick it over a beer or soft drink bottle, the crown top jumps off and a magnet grabs it. Make a great gift, or useful cool tool near your fridge. Someone registered the unimaginable idea of a crown cap shaped bottle opener in the USA, and we have been threatened by a self confessed lawyer with disgorgement which sounds nasty. If you are affected, no need to get in 50 or is it 51 or 52 states about it, there are other terrific versions. Zap Cap Crown Cap Bottle Opener text, images and video are copyright.